Adventures and laughter – coupled with fun friends and good food – sure are balm for the heart. Sometimes the curve balls of life make us so short-sighted that we forget about how good things are. Thankfully, some people and events refuse to be put off, and we get the gift of a refresher course. Yesterday was just such a delicious gift. My dear husband’s only sister and her husband had a spectacular event to celebrate. A once in a lifetime, outstanding festivity. A Fifty-Year-Golden-Anniversary-party. Hot dawg! Shazam! Wowzers! Good golly! They were just young things when they married – but oh what a grand celebration we had! My husband and I are a bit out of practice at celebrating these days. The curve balls of life have kept our noses to the grindstone with festivities lamentably too few and far between. It was fun getting ready for this one. First, we had to blow the cobwebs off of our sweet selves and do some excavating in our closet to find some presentable party clothes. Primping with makeup and jewelry, and oh yes, that lovely extravagance – perfume. Almost forgot about that! My phenomenal husband changed out of his daily uniform of jeans. Oh, my. Hot damn. Sit down and fan myself. He sure scrubs up well! Then we drove, clear-the-heck-over to the other side of the universe, from our house out in the desert, to the heart of Tuscon. 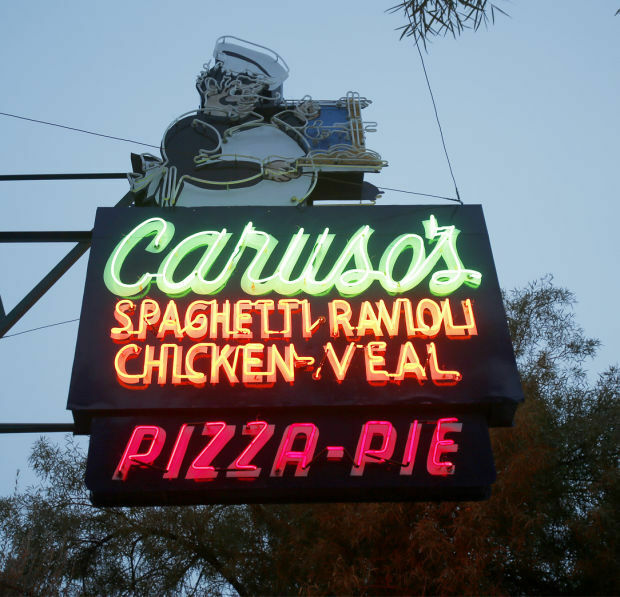 Caruso’s, North Fourth Avenue and East Sixth Street, an extraordinarily grand old Italian restaurant run by four generations of the Zogona family since 1938. It was a new adventure for me. Finding a parking place was a tad bit of a challenge on a busy Saturday night, but even that had a jolly solution. We parked across the street from my sweet husband’s boyhood home on North 3rd Avenue, and we walked. What is it about friends, family, excellent food, drink, and celebrating? Cobwebs and preoccupations go away. Smiles erupt. Stories get told. Laughter interrupts. Fun is had. Everything looks fresh and peachy again. Thank you two, Margo & Jim, for inviting us to share in your amazing celebration. We love you, and we sure do think you have excellent taste in restaurants and friends! This entry was posted in Family, Friendship, Marriage and tagged Blessings, Celebrate, Friendship, Love, Marriage, Memories, Thanksgiving. Bookmark the permalink.